Who’s Tuning In to f8 Live? Yesterday morning changes to Facebook’s News Feed went live. Whether you love the changes or hate them, there are more — and likely more dramatic — Facebook updates and announcements slated for today. Rumors have been circling for weeks about the additional product announcements that Facebook will make at their annual f8 Developer’s Conference, which kicks off in a half hour (12:30pm EST, 9:30am PST). We were curious about who is most interested in catching the live streaming of f8, so we dove into our Facebook advertising platform’s campaign data. 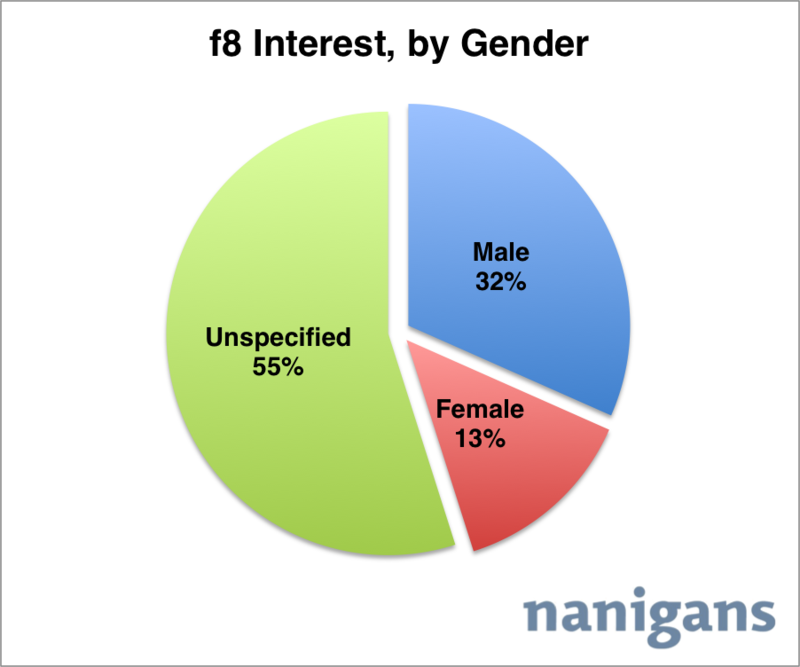 The below map shows relative US interest in f8 on Facebook. The darkest blue states represent 5% or more of US interest in f8 on Facebook, with lighter blue states representing less interest. Combined, just four states represent over 50% of Americans interested in f8: California (33%), New York (9%), Florida (6%) and Texas (6%). 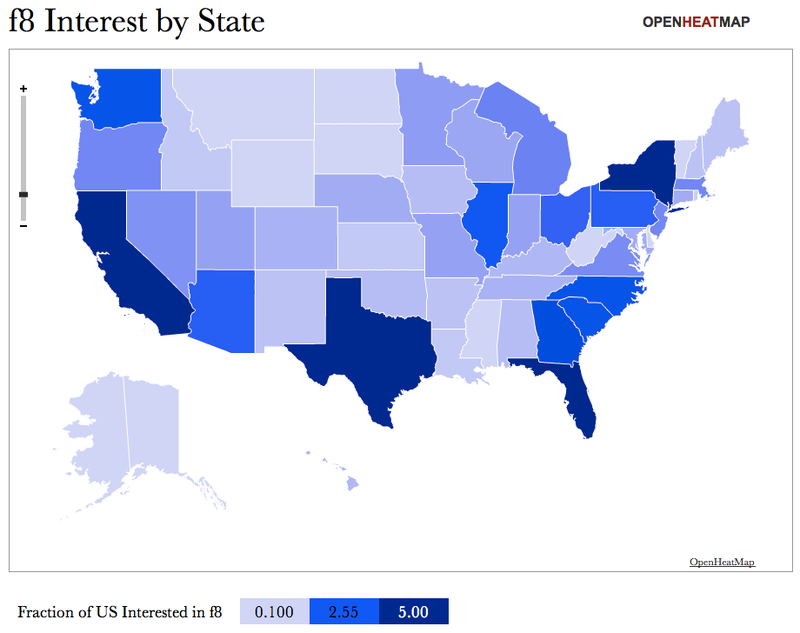 States with the least interest in f8 tend to be in middle America and the Northwest: Alaska, Delaware, Mississippi, Montana, North Dakota, South Dakota, Vermont, West Virginia, and Wyoming — with each representing 0.1% of Americans interested in f8. To view the exact state percentages, click the map image or visit the map directly on OpenHeatMap where we uploaded our data. 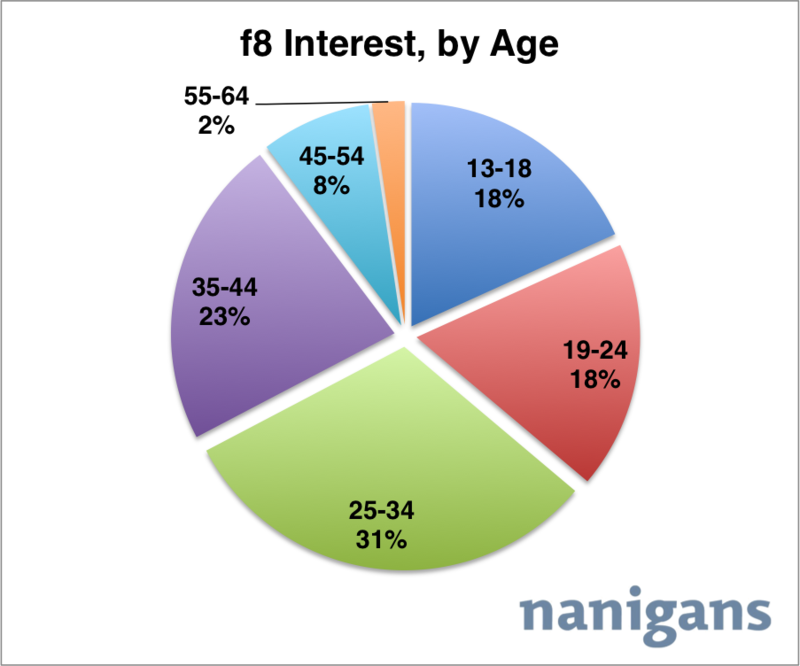 Interest in f8 declines with age, with those over 45 years old representing just 10% of Americans interested in f8 on Facebook. Gen X and Y represent the largest interest age ranges, with those between the ages of 13 and 24 representing 36% of interest and those between the ages of 25 and 34 representing 31% of interest.